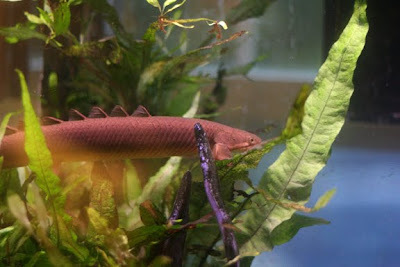 Meet the eel or what I commonly call him, the Sea Monster. Well, he does look like a sea monster. Aside from 2 cats and countless plants, we also have two fish tanks. The tank upstairs is where the eel lives. 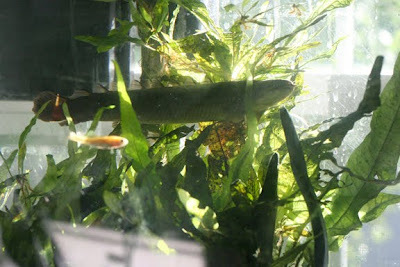 The eel has been around for at least 3 to 4 years now. The photo above, with the cute little fish in it ... that cute little fish will be an eel snack here soon. The eel had kind of been in hiding for the last year or so because there were two other fish, of the shark variety, that had taken over. One of them would eat pretty much everything as soon as Shawn put food in. And yes, often, the food was the cute little fish. I've never been a huge fan of the fish-eating-fish theme of this tank, but cest la vie. Within two weeks, the other shark fish, committed suicide. Guess there was some kind of fish suicide pact or perhaps the other fish in the tank conspired and had something to do with it. 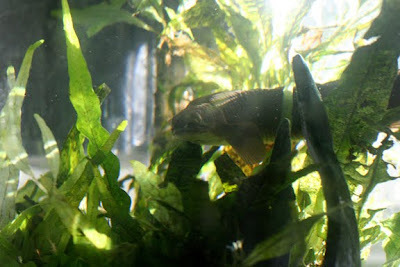 Anyway, since then the eel has been out and about much more. So today I got some pics of him. To give it some perspective, the eel is about 7 inches long and at its widest probably an inch to an inch and a half in circumference. This eel once swallowed one of those shark type fish whole. It's definitely a sea monster.